We donate DVDs, video games, books and much more nationwide! The mission for Kayla Cares 4 Kids is to help sick kids feel better by providing entertainment and educational items to medical facilities and supporting organizations. 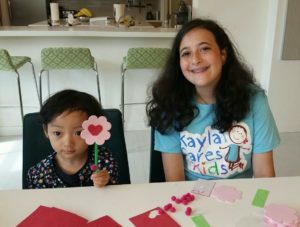 Kayla Abramowitz founded Kayla Cares 4 Kids in 2013, at the age of 11. She and her youngest brother, Ethan, know first-hand what it’s like to spend weeks at a time in the hospital, and decided to collect and provide items to hospitals and other facilities helping sick children. The idea is to keep the kids entertained and educated, to help them keep their minds off the illness and treatment, and to make them smile. Kayla Cares 4 Kids has already donated more than 17,000 items to nearly 450 children’s hospitals, Ronald McDonald Houses, as well as related facilities throughout the country! Donated items include DVDs, DVD players, game consoles and video games, books, board games, and arts & crafts. With your support, we will help replenish supplies as needed and find even more places that need these donations!